Rendering of possible boulevard design and connection to the street grid, with potentially developable land in yellow. Image by DDOT. 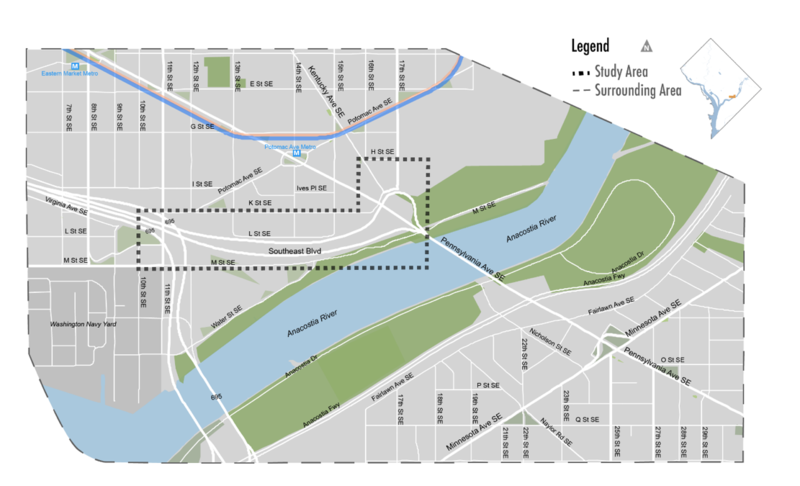 The District is trying to replace the awkward, unattractive former highway that divides Capitol Hill and the Anacostia River with a revamped roadway that can provide a range of public benefits — chief among them better connecting those two areas of the city. However, recent meetings highlighted the potential and the challenges of tackling a major project trying to meet multiple objectives. 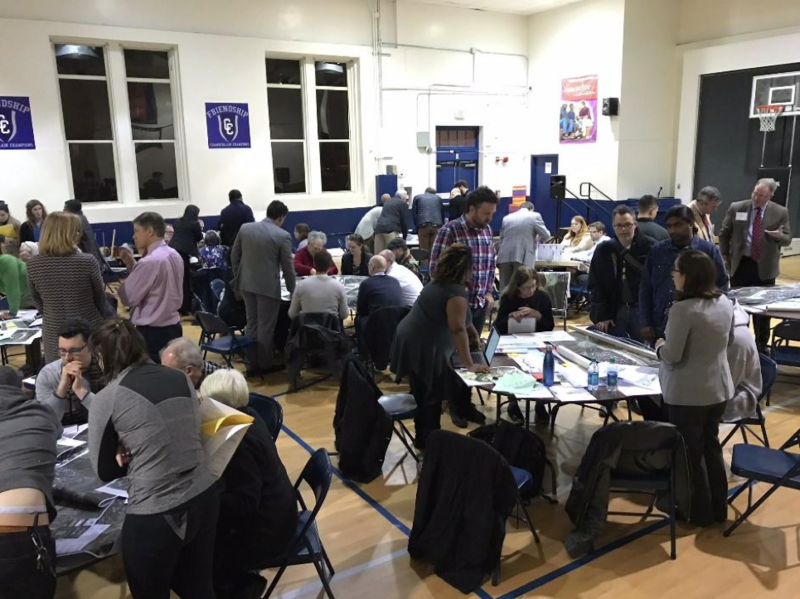 On December 11, the District Department of Transportation (DDOT) held the second community meeting on the redevelopment plan for the Southeast Boulevard and Barney Circle. Earlier this fall DDOT gathered public input on the goals for the redevelopment process, and this time they came back with initial design options. Participants at DDOT’s second public meeting on the Southeast Boulevard and Barney Circle redesign. Image by the author. 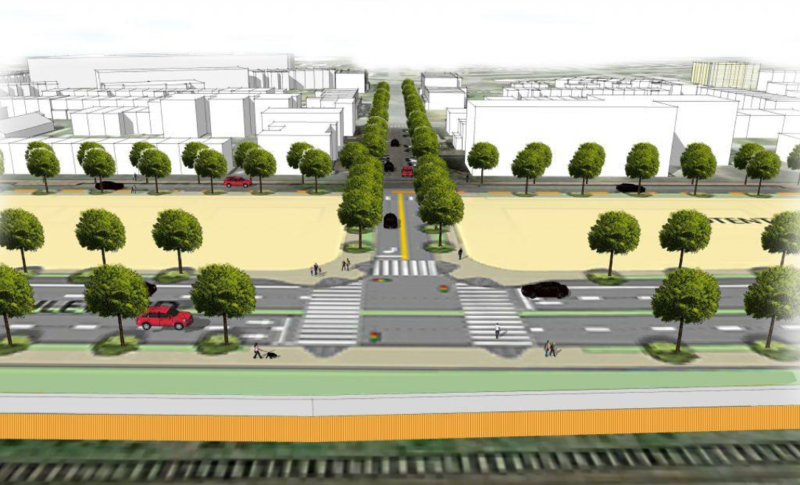 DDOT presented a variety of options for the boulevard and circle. One map showed a conventional intersection at Barney Circle, while the other showed a traffic circle. Another showed a single connection down to the river, while the other had two connections toward the ends of the boulevard. The final design could include elements from either map, or even new elements based on community feedback. Barney circle design alternatives. A traffic circle (left) or intersection concept (right). Image by DDOT. DDOT planned to have each table conduct a series of group activities that were designed to elicit feedback by getting community members to work through design elements. 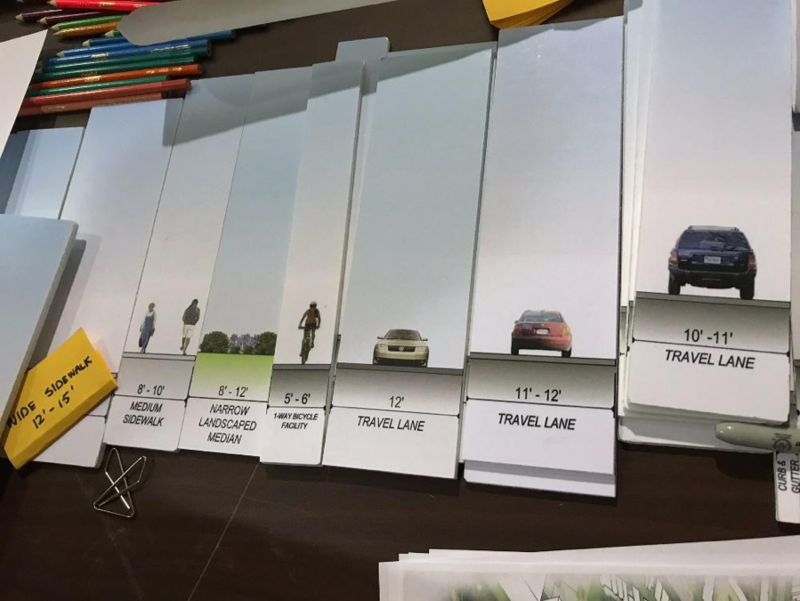 One of the more interesting was a series of cards with roadway sections — bike lanes, medians, turning lanes — that participants could arrange into different roadway layouts. Sadly, few of the groups actually worked through the activities DDOT laid out. Instead, many of the discussions fixated on a narrow set of neighbor concerns. Some residents were concerned about lost view or added noise from traffic, but most criticism focused on DDOT’s proposal to include a subterranean bus transit facility. Currently Southeast Boulevard sits about 40 feet below the elevation of L St SE and the rest of southeast Capitol Hill. All project options include raising the elevation of the boulevard, which means either bringing in large amounts of dirt or building something underground and stacking the road and other improvements on top. DDOT proposed adding a facility to house and service buses, primarily the Circulator Fleet but potentially also DC-serving WMATA buses. Some residents objected to this plan, and there was vocal frustration that DDOT didn’t present a ‘no bus facility’ option. The objections range from concern about environmental impacts to traffic to noise. Some participants at both this meeting and previous meetings argued in favor of no project at all, rather than any option that includes a transit facility. DDOT’s argument for adding the transit facility is partly functional and partly financial. It’s impractical to raise the roadway by bringing in truck after truck of dirt, and the transit facility would help justify the cost of the project. Another reason, one emphasized less by DDOT, is that the city needs this facility and finding feasible locations is really hard. The transit facility highlights how the Southeast Boulevard and Barney Circle project is one that can and should serve a range of stakeholders. It will connect Capitol Hill to the river, shaving close to a mile off the trip for some residents. It will improve transit connectivity for projects like the stalled Planned Unit Development at 1333 M St SE. It would create new developable land, which could support more housing and, importantly, more affordable housing. It would also provide the city with a much-needed facility to manage part of its bus fleet. Study area and surrounding area of the project. Some elements could affect a much larger set of stakeholders. Image by DDOT. Neighbors tend to focus on the potential benefits and impacts that will affect them directly, but a project like this needs to be considered through a broader lens. Each neighborhood in DC — ours included — needs to house projects that serve not only the hyper-local community but support broader city goals. The key is to do that in a way that maximizes benefits and effectively manages impacts. A bus transit facility that houses a fleet of modern electric buses with high-quality environmental controls and effective traffic management would have little appreciable impact on the neighborhood. We have the opportunity to push these kinds of positive directions through the DDOT process. Based on this public meeting, there are a number of ways DDOT could improve the project to ensure it serves a range of stakeholders and meet the goals of high-quality urban redevelopment. Bike travel design and options. Image by DDOT. In addition to pushing for an environmentally-sound transit facility, the current project concepts need more clarity on the amount of potentially-developable land and what type of housing it could support. DDOT asked participants at the meeting to weigh in on the size of the median between traffic lanes, but if a larger median appreciably reduces potential affordable housing, is that a tradeoff worth making? 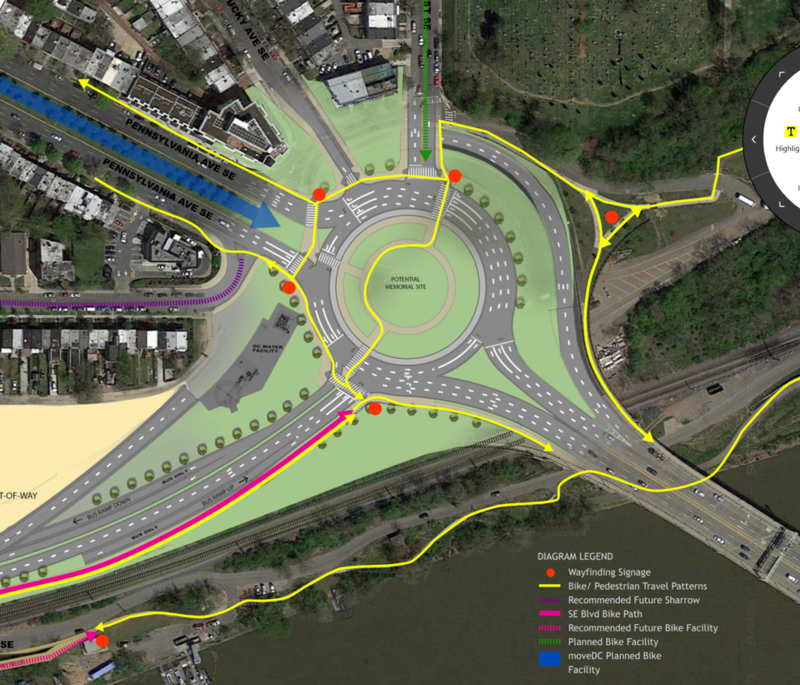 The traffic circle option for Barney Circle is visually compelling and would provide a terrific terminus to the Souza Bridge, but does it effectively support bike and pedestrian traffic, or is the emphasis on vehicle traffic too strong? The bridge-like connections to the river are terrific, but there may be ways to make them more visually appealing, more accessible, and more useful. DDOT is asking for public feedback — from neighbors and from anyone — now through January 24, 2018. The city needs to hear from a range of stakeholders on this project, and DDOT seems genuinely open to good ideas. We’ll all be better served if the feedback focuses on how to make the project a success for the neighborhood and for the city as a whole. Nick Burger moved to Washington, DC in 2008 and has been an ANC commissioner (6B06) since 2015. He focuses on housing and urban development issues through the ANC and chairs 6B’s Planning and Zoning Committee. He volunteers most weekends with Habitat for Humanity DC. Nick lives in Capitol Hill with his wife and two children. What DC Streetcar station is between 13th St and 19th St on the H St/Benning Rd Line? Feel free to ignore station subtitles.